With a cast as wacky as its narrative, “Jumanji: Welcome to the Jungle” is a remake made in remake heaven. Feeling nostalgic? Well then, we have good news for you! Recently, a remake was released of the 1995 childhood classic, “Jumanji.” Reconnect with your inner child with the new-and-improved version, “Jumanji: Welcome to the Jungle,” which features an unexpected group of notable actors. The main cast consists of Dwayne “The Rock” Johnson, Karen Gillan, Jack Black, and yes, Nick Jonas himself. All of the cast does a phenomenal job of portraying their characters thoroughly. The casting is impeccable — one could not have chosen anyone better than Jack Black to play a popular teenage girl trapped in the body of an overweight middle-aged man. Similarly, no one could have done a better job than Johnson at playing the strong, heroic Dr. Smolder Bravestone. Simply put, the acting in this film has just the right amount of excitement, humor, sincerity, and irony. The plot of the story is quite similar to that of the original. However, in order to accommodate the interests of a younger generation, the game of Jumanji transforms itself from its original board game style into a video game format. Each person has to pick a character to play the game and they proceed to get sucked into the virtual reality in their chosen character’s body. Four high school kids with differing personalities are trapped into the game of Jumanji, in which they ironically embody a character completely different from themselves. The object of the game is to return a stolen jewel to its rightful place in order to save the land of Jumanji from peril. Each player starts out with three lives that they can use, but if all three lives are lost, the person inhabiting the character also dies in real life. Throughout their quest to save Jumanji, the crew battles monsters and ‘bad guys,’ but in the process, also learns to overcome their inner demons. Despite the intensity of the plot itself — you know, with all the battling monsters and coming face-to-face with death — there is also a medley of funny, sweet, and heartwarming moments. The juxtaposition of all the players embodying their literal opposites in the game is a humorous spectacle because we can relate to how awkward and confusing it would be for us if we were in their situation. The characters in the movie are relatable to the viewers because watching them make mistakes and embarrass themselves allows us to reflect on and laugh at ourselves. We can view these characters as sort-of representations of ourselves to help us realize that people are complex creatures: nobody is always brave, or always confident, or always funny. The players eventually realize that, while having their character’s superhuman strength or the ability to dance-fight may help in the game, much of the grit that is required to win has to come from within themselves. 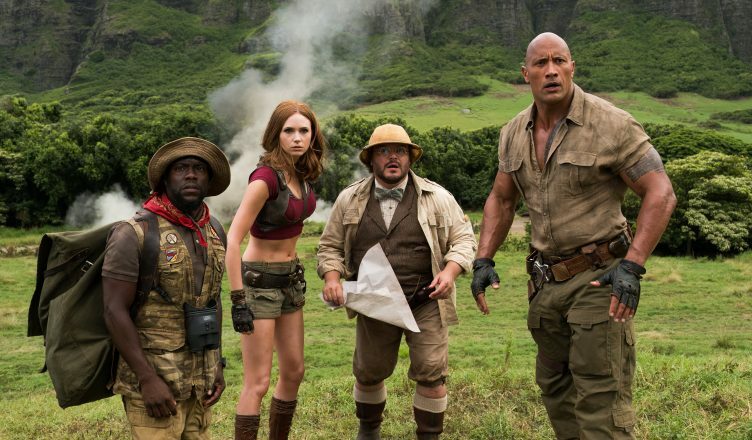 While many remakes of classic films often fail to deliver the same level of gratification that the original did, “Jumanji: Welcome to the Jungle” is an exception. The movie was well cast, funny, and relatable, with just the right touch of nostalgia. Treat yourselves to a movie night at your local movie theater, use your student discounts, kick back, and enjoy watching Jack Black crush on Nick Jonas.